Buy 3 Tires, Get 1 Free! 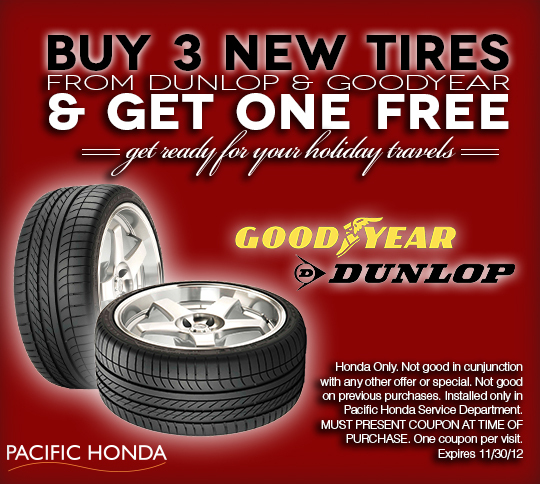 Road trip season is upon us and now for only two more days, buy three new tires from Goodyear or Dunlop, and receive the fourth free!! Now through November 30th! We hope everyone had a wonderful Thanksgiving will friends and loved ones! 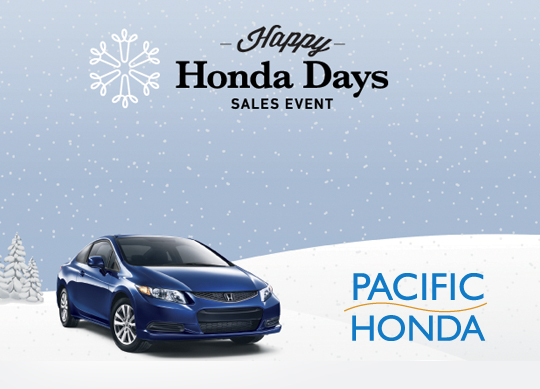 We're still full from the feast, but are excited that it's officially HAPPY HONDA DAYS at Pacific Honda. Come on in and see our huge inventory all with holiday pricing. We can't wait to help you find the Honda that will make your days Happy! 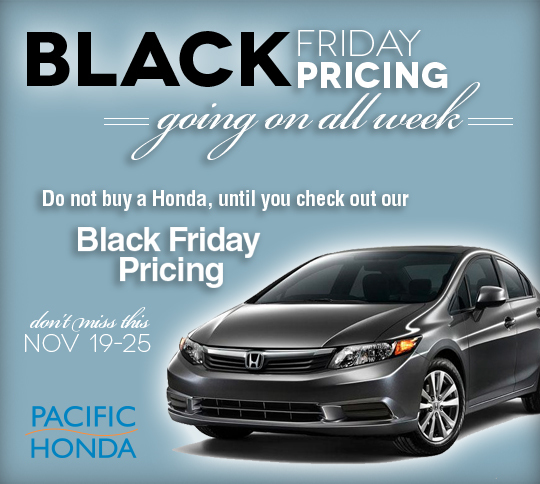 Get ready Black Friday Pricing at Pacific Honda! We've donated to the American Red Cross, as our teeny part in helping the survivors to get back on their feet. We hope that you will too! 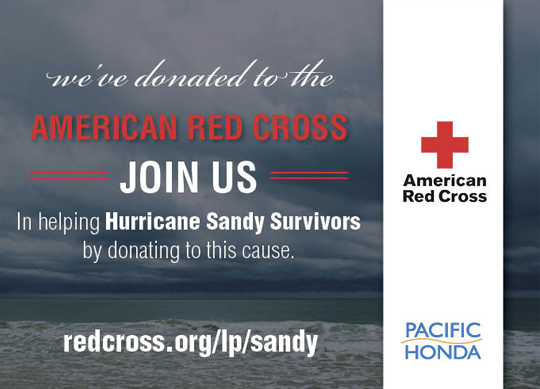 It's easy, just visit redcross.org/lp/sandy and click the red "Donate Now". Certified APR going on NOW! If you've been waiting for the right opportunity to finally purchase your Certified Accord, Civic, Fit or Odyssey, now is the time. Stop in and check out our gigantic inventory. You'll be overwhelmed with excitement instead of stress! Lease a 2012 Crosstour EX-L V6! Need a little more room? 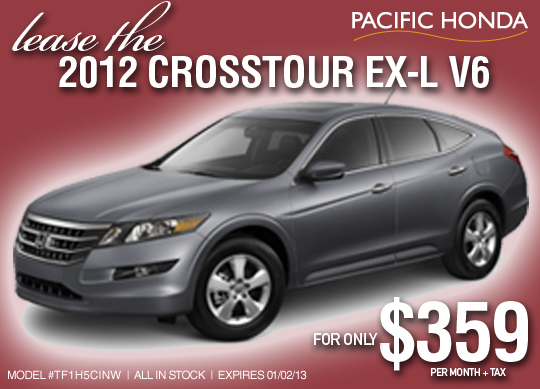 Lease the 2012 Honda Crosstour EX-L V6 for only $359 per month (plus tax)! The Crosstour is definitely cargo-ready with its ample cargo space, the easy fold-down 60/40 split rear seatback, and the hidden, removable utility box. 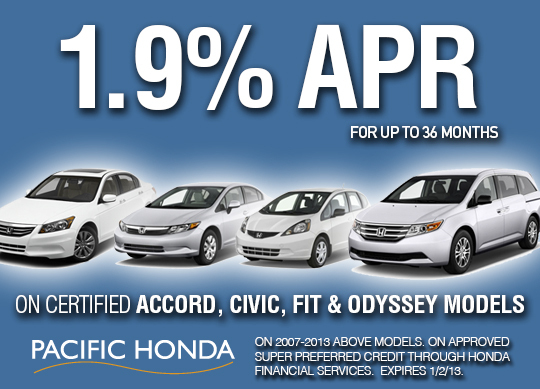 Drive one today at Pacific Honda! $359 a month plus tax for 36 months. Only $800 due at signing. Offer expires 1/02/2013.